Do you need to integrate modern technology or media equipment into a lecture, speech, or presentation? These multimedia lecterns, or portable classroom podiums, are perfect for contemporary teaching, training, and professional environments. These innovative multifunction workstations provide a full range of features that enhance the audio and visual components of any presentation. 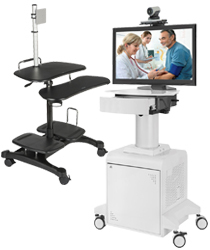 Portable multimedia lecterns are designed with both mobility and utility in mind. Smooth rolling caster wheels make it easy for users to relocate these workstations to different locations as needed, and frequently lock for stability during use. These sturdy multimedia lecterns are easily moved from place to place as needed, while ensuring that expensive AV equipment, presentation accessories, and laptops stay safe during transport. 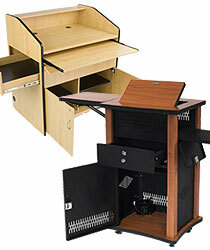 Storage cabinets and adjustable shelves are another common element of classroom podiums and workstations. Some of the cabinets even have perforated walls for increased ventilation and air circulation to protect delicate electronics inside. Multi-shelf equipment podiums are ideal for supporting and storing projectors, laptops, TV monitors, and other electronic gear for presentations as well as for keeping them safe when not in use. 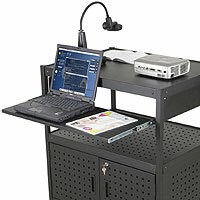 These versatile portable workstations are ideal furniture for schools, conference centers, offices, and training rooms. 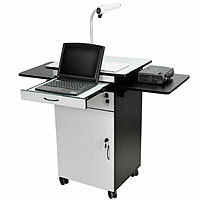 What are the different types of portable classroom podiums currently for sale? Multimedia lecterns are the most elaborate of the AV presentation furniture. 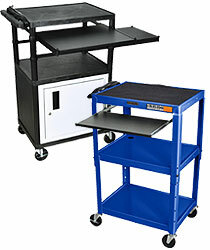 These rolling workstations feature durable construction with roomy locking storage cabinets. Flip-up shelving and work surfaces are found on many designs, which allow users to place projectors, media players, laptops, and other hardware. There are also a number of lecterns with slide-out trays and drawers to accommodate keyboards when used with a laptop or computer tower. Pre-cut cord management holes and channels ensure that cables can be passed through for easier setup and connections. 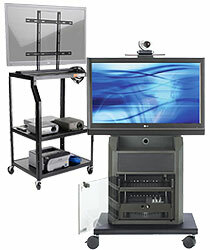 Traditional AV carts are mobile equipment trolleys that are ideal for transporting equipment to and from classroom settings in schools and training centers. These versatile stands are designed to accommodate "classic" presentation equipment such as projectors, tube televisions and monitors as well as newer media accessories such as flat panel screens, laptops, and webcams. Rolling classroom carts also feature protective and convenient elements such as locking cabinets, cord wraps, and lockable caster wheels. TV & monitor trolleys incorporate specific mounting hardware designed to securely support flat panel and LCD display screens. Made with maximum visibility in public environments in mind, this type of classroom and training furniture also includes presentation equipment storage and mounting space. Single and multiple monitor displays, camera shelves, and locking cabinetry allow these rolling TV stands to reach audiences ranging from classrooms to conferences to training centers and trade shows as needed. 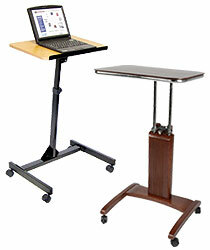 Laptop stands are designed to function as portable workstations or simple rolling podiums as needed. Most of our notebook computer displays are compact and feature wheels for easy mobility. 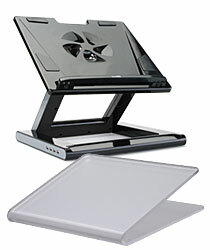 Some laptop stand models offer multiple work surfaces to accommodate components such as auxiliary keyboards, mouses, and even tablets. Many of our laptop stands are height adjustable, which is perfect for presentations where the speaker may be standing, seated, or both at different times. Our more traditional wooden options feature less adjustability but offer classic style that complements any environment. There is even a design that attaches to the wall and folds out. Whether they are made of powder coated metal or finished wood, our media lecterns and smart cart podiums library furniture are built to last. The top surface of each presentation stand is extremely durable and can withstand lots of hard use. Some of the media carts even have rubber mats on the top to prevent electronic components from sliding around or causing damage. Included power strips and multi-outlet plugs make setting up and giving presentations easy. In fact, many of these versatile AV trolleys come with extra-long power cables as well as a cord wrap for simple operation, storage, and transport. Lock in caster wheels prevent the sturdy rolling presentation lecterns from unwanted movement during use. Our classroom or AV podiums come in an array of colors and finishes to match any decor. Traditional wood construction, modern-looking metal styles and lightweight contemporary plastics and acrylics are all available to complement a variety of environments. 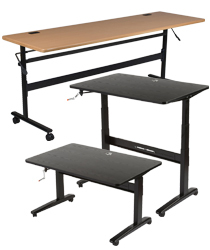 Style, functionality, and economy allow these portable workstations and equipment stands to benefit schools, libraries, conference and training centers, professional offices, and special events. The wide selection of designs and styles allow any business, organization or facility to find just the right style, size, and price point to match their specific needs.